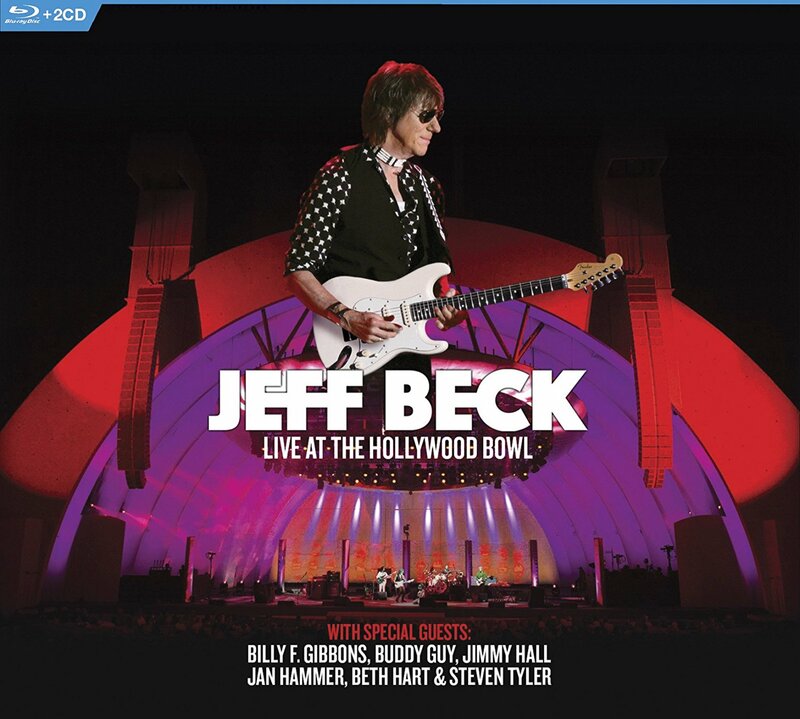 DVD/CD Review: Jeff Beck, "Live at the Hollywood Bowl"
I’ve been a fan and was influenced very early on by The Yardbirds. I was never keen on Eric Clapton (and still am not) or Jimmy Page (although I do love Led Zeppelin). I’m also not a great fan of guitar virtuosos. Watching the uber-flashy style of someone like Eddie Van Halen was always a cringe. But Jeff Beck IS the one true master – and he was, to me, THE Yardbirds’ guitarist who mattered. Go back to “Over, Under, Sideways, Down”, “Shapes Of Things” or “Mr. You’re A Better Man Than I” – his playing was fluid, took good songs and gave them life and his sound was absolutely his own. Hence, he’s the only guitarist whose career I’ve followed from the time he founded The Jeff Beck Group in 1968 through all his solo albums up to Flash. There have been moments, I’m happy to say, when I’ve been able to cop a lick or two or nail one of Beck’s solos in my own playing but he’ll always be the guru as long as I play a Telecaster. Even though he joined The Yardbirds in 1965, in 2016, Beck celebrated his 50th year as a living guitar legend with an unbelievable performance at the Hollywood Bowl and he did it in style with some incredible guests to help out – all heavy hitters in their own right. Among the names on the bill include Beth Hart, Billy Gibbons and Steven Tyler. Just from that alone, you should immediately understand that this was not going to be some ordinary concert with “special appearances”. This also marked a major step forward for the newest gathering of players backing Mr. Beck, including powerhouse singer Rosie Bones and guitarist extraordinaire Carmen Vandenberg (both of the band Bones). Longtime collaborator Jan Hammer is back behind the keyboards and there is no dearth of Jeff Beck classics in the mix of numbers performed. Early on – the second song of this set – we’re immediately treated to the epic “Over Under Sideways Down” which follows into “Heart Full Of Soul” and “For Your Love” – three of The Yardbirds’ greatest hits and done with great energy with stellar vocals by Jimmy Hall of Wet Willie (!). The monumental “Beck’s Bolero” is next (and what a magnificent band he has), leading into The Jeff Beck Group standard “Rice Pudding” and onto “Morning Dew”, again, sung by Mr. Hall. One of my favorite pieces of Mr. Beck’s from 1980’s There And Back (probably my most-loved Beck solo album) is “Star Cycle”, where he’s joined by Mr. Hammer, who shoots keyboard melody to match Mr. Beck’s guitar fireworks. Of the guest appearances that stand out (in a show filled with stand out moments), the incredible Beth Hart (who I’ve loved since she was on Atlantic Records when I worked there) rips through a version of “I’d Rather Go Blind” that induces chills; the legendary Buddy Guy joins Mr. Beck for “Let Me Love You” and Steven Tyler just tears the roof off the Hollywood Bowl with his near-perfect imitation of Rod Stewart on “Shapes Of Things”. The finale is a tribute to Prince, as the group tears into “Purple Rain”. All in all, a breathtaking collection and gathering of performances. This release comes as a Blu-ray/DVD with 2 CDs; so thanks, Mr. Beck for your 50-plus years; because of you, my 39 years of guitar playing have always been infused with your influence and I’m grateful. So too am I glad that there’s a document of this celebration, which is so richly deserved.